What’s big and yellow and loves to eat rocks? The answer to that riddle is the Vermeer T1055 Commander hydrostatic trencher owned and operated by R.B. Hinkle Construction, a PLH Group Company. 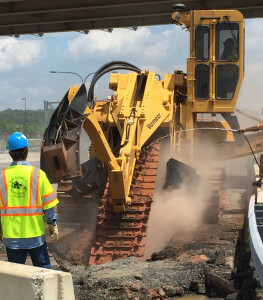 The machine is currently chewing through a 10-mile excavation of hard shale for Phase 2 of the Dulles Corridor Metrorail Project, the Washington, D.C., Metrorail Silver Line Extension, which will run from Reston to Ashburn, VA.
R.B. Hinkle, an underground utility contractor, was brought onto the project by Midasco Construction, the electrical subcontractor responsible for installing duct banks and manholes for the electrical service. Digging the six- to 12-foot deep by three-foot wide power trench with traditional excavation means, a hoe-ram/backhoe combination, was progressing slowly due to the abundance of hard, dense shale in the soil, according to Todd Gieseman, R.B. Hinkle’s director of business development. Even so, the $2 million, 10-mile power trench won’t be completed until June 2016. That’s because the work takes place right next to a busy highway. “Due to public safety and traffic control issues, we never get in a full day of trenching on this project,” explains Gieseman. The 11.4-mile Silver Line Extension will provide six new stations between Reston and Ashburn, including one at Dulles International Airport. The project will involve additional trenching for storm drainage, and Gieseman hopes R.B. Hinkle’s trencher will be involved in that work as well. In addition to dramatically increased production rates, R.B. Hinkle’s trencher offers other advantages over traditional excavation means. It can cut through harder rock, including limestone, granite, shale, and sandstone, which often eliminates the need for dangerous and expensive blasting. In addition, the trencher grinds and discharges its spoil as small-diameter, reusable backfill, which reduces or altogether eliminates the need to pay for off-haul services. R.B. Hinkle is the only underground utility contractor in the Washington, D.C., area to own a trencher of the T1055’s size and capacity. See the Vermeer T1055 Commander in action below. About R.B. Hinkle Construction, Inc.
R.B. Hinkle Construction, a PLH Group Company, is an underground and overhead utility installation contractor, specializing in the installation of conduit, manholes and street lights through trenching, directional drilling and moling. The company also provides underground energized cable installation, including replacements, upgrades, new cable and service restoration. For more information, visit www.RBHinkle.com. PLH is a leading provider of construction and maintenance services to the electric power delivery and pipeline industries in North America. Its customers include many of the largest utilities, regional cooperatives, renewable energy developers, commercial and industrial customers, and major oil and gas producers and midstream companies. PLH has acquired Sun Electric, TESSCO, Air2, Auger Services, Snelson Companies, IPS Engineering, Southeast Directional Drilling, M&M Pipeline Services, Energy Services South, Pipeworx, Edison Power Constructors, TTR Substations and R.B. Hinkle Construction. For more information, visit www.PLHGroupInc.com.